In many ways the DVD format seems tailor-made for opera. The audio and video quality, combined with the range of additional features that can be supported by the DVD format, would suggest that there is a close proximity to the live experience to be gained. 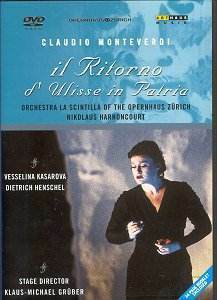 This DVD of Monteverdi’s late opera Il Ritorno d’Ulisse in Patria provides a fine musical performance, but it does bring up issues relating to the presentation of such works on DVD as compared to CD. First, the musical aspects. The main recommendations for this performance must be the presence of Dietrich Henschel in the title role, and of Nikolaus Harnoncourt as musical director. Henschel has been making quite an impact in recent years, and the control of expression that he employs is amply demonstrated in this performance. Musically he is never less than convincing, although some of the physical aspects of the performance appear rather mannered, and may be difficult to watch on a regular basis. However, unlike many opera singers, he does not go in for grotesque facial contortions, even in passionate moments, and this not only makes him easier to watch, but adds to the consistency of vocal control that makes his voice so admirable. The other main role, Ulisse’s long-suffering wife Penelope, is almost a reverse situation. Vesselina Kasarova’s physical command on stage is impressive and her static gestures are conceived to enhance the music she is singing. She has a marvellous voice quality, her low register being almost masculine in its richness, but the control that is such a feature of Henschel is less apparent with Kasarova. Some of the agitated passages tend to move toward a bel canto obfuscation of the actual pitches. Of the other roles the two that stand out are Telemaco (Ulisse’s son), sung by Jonas Kaufmann, and Minerva, sung by Isabel Rey (who also takes the role of Amore in the Prologue). Kaufmann has a youthful clarity of voice. His duet with Henschel when Ulisse first returns to Ithaca and appears to Telemaco as himself (being normally disguised as an old beggar), at the end of Act One is ravishing. Isabel Rey’s Minerva shows versatility in acting and singing. She ranges easily from a boyishly youthful arioso to an impressive display of deitific grandeur. She has an additional competent line in dancing. Such consistency is not, however, uniform. The Gods Neptune and Jove (Pavel Daniluk and Anton Scharinger) sing with impressive bass gravitas, if not much in the way of variation, but the acting of both is basically stilted and limited in expression. The same gestures appear over and over, bringing to repeated viewings images of worthy opera-school levels of acting. Similarly Iro (the glutton), sung by Rudolf Schasching is fairly consistently two-dimensional. While activity on the stage is a bit of a mixed bag, the Orchestra La Scintilla, playing on a mixture of modern strings, with period wind and continuo instruments, is consistently impressive. It is a large band; possibly too large for the recitative-arioso style of the music, but arguably required by the size of the theatre. Nikolaus Harnoncourt controls the players with expected authority, although it is clear that his gestural style has become a lot simpler over the years. Sometimes he appears to do no more than wave a single hand vaguely in the direction of the band for a final chord, but the sound that follows shows that the players are attuned to every nuance of his gesture. It is marvellous to watch such control of large forces appearing to be so effortless and is a testament to the work that Harnoncourt has done over the years teaching modern instrument bands to play with the style and panache of the period instrument groups. To come now to the second issue, there are, as mentioned above, questions about the DVD format in comparison to the CD format. This writer supposes that the main advantage of the DVD format must be the addition of the visual aspect. If this performance had been on CD, only the musical aspects would have been assessable and the result would have been a generally satisfying performance. On the DVD we can see what the audience in the Zurich Opernhaus saw. Regrettably, as far as set design, stage direction and costume go the results look very half-hearted. The fashion of the day is for stripped down minimalism and that fashion is abundantly apparent here. But, frankly, the set looks like a school carpenter knocked it up in half a Friday afternoon. Much of the action takes place in front of a whitewashed, roughcast wall. This is supposed to hint at the landscape of a Greek island. From a distance, that may work, but the camera brings us much closer than the live audience, and then the wall looks like some painted hessian on a wooden frame – which is what it is. When the wall is not in situ we are left for much of the time with a bare revolving stage and a surfeit of blue light. Occasionally a statue is added, although why the shepherd Eumete should sing about life in the fields and hills while sitting on a large, very civic statue of a bare-breasted goddess apparently made of jade is not immediately obvious. There are other oddities. Ulisses is dressed most of the time in what looks like a fisherman’s jumper straight out of Peter Grimes while Penelope spends the whole opera in the same black cocktail dress. A party of Guernsey-wearing sailors in Ulisse’s boat sings to the accompaniment of a cittern player wearing tailcoat and white bow tie. Clearly he has come from the orchestra pit. Why should he be on stage for this one scene? If on stage, could he not have a costume. He must feel as out of place as he looks. It is very odd. Overall, the visual aspects of the production are confused, inconsistent and just look cheap. It is a great pity that, while the musical sides of early opera have benefited hugely from the whole ‘historically informed’ movement, the stage production aspects continue to be unwilling to follow suit. Baroque stagecraft, even if it were with an updated approach to technical aspects, has so much to add to the overall effect of a production of Baroque music-theatre. The form of militant minimalism used here is nowadays looking very dated and seems to have nothing to add to the performance. This is where the problem with putting it on DVD becomes most obvious. If there is little to see, and what there is looks dull, then where is the point in using a visual medium for the recording? A CD would have been better. Good music on this, and well sung, but unfortunately difficult to watch regularly.